Living World Nibblers Candy Corn Husk Chew is a candy-shaped corn husk chew with raffia ends. 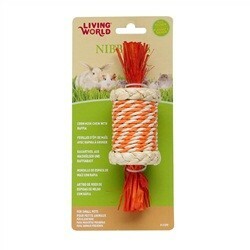 Living World Nibblers are specially designed chew toys that help improve your small pet’s dental health. They are also fun to chew on and are an excellent boredom buster.